Top 8 Chinese Gaming Apps Of 2019 The Chinese mobile gaming industry has witnessed an exponential growth of 250% in the past three years as reported by App Annie’s 2017 retrospective report. According to the same research, Japan is leading the way by being one of the top consumers in the gaming industry. It has one of the highest market value of Chinese games, reaching a staggering figure of USD 13 billion and China coming to a close second to the amount of USD 11 billion. The statistics are mind-blowing, even though there is there is no Google Play store in China and only 34% are iOS users in the region. The Honor of Kings (王者荣耀) is by far the most popular game in China with 55 million active gamers and leads the front by being the world’s highest grossing game. It generated revenue of USD 875 million in its first quarter only, and you can imagine what a sensation this game must have created. Tencent Holdings are all set to launch this game in America and have rebranded it to ‘Arena of Valor’ for the international markets. This multiplayer online battle arena game (MOBA, for short) is based on the similar concepts of e-sports juggernauts DOTA 2 and League of Legends, where players can team up five fantasy characters and have a 5 on 5 battle to destroy the opponent’s base. With great focus on visual design, characters and sound & music, players can choose characters from Chinese folklore to popular Western fantasy characters like Batman and Wonder Woman. Onmyoji （阴阳师）is a mobile CCP RPG which was launched in early September 2016 by the net gaming giant NetEase. It was formally launched in the West in February 2018 on Android, iOS, and Steam. This collectible card game has a fascinating array of characters, ranging from a wolf swordsman to fox spirits, each having their own unique abilities, battle models, and backstory. As the game progresses, each character evolves and levels up with more rarities and skills, giving the player a chance to interact and socialize with other players near their own geographical location. This detailed and dramatic game keeps the players hooked with a story rich RPG experience, professional voice-overs and sounds that bring characters to life. Fantasy Westward Journey （梦幻西游）is another popular game by NetEase that has over 250 million active users in China and is based on a Chinese folklore. It revolves around a priest who travels with three companions including the fabled Monkey King. The game and character design have a child-like cartoon feel that attracts the audience instantly. Fantasy Westward Journey not only pays homage to the Chinese cultural legacies but also recreates the classics to the current tech-savvy generation in a very catchy way. The re-imagined scripts and latest gaming technologies make it a must-play game for anyone who loves Chinese games. QQ Speed (QQ飞车) is an online multiplayer racing game inspired by Mario-Kart. It became an instant hit in the market and was the 6th top grossing game in January 2018. It is a simple racing game in which players are expected to compete with other races on a variety of tracks, collect various items and Nitros boost to hinder the opponents from winning the race. Players can also alter their avatars to satisfy their pursuit of uniqueness. This game Knives Out （荒野行动）lets you team up with a friend on a 6 .4 kilometer island with lots of weapons, and the only objective is to be the last man standing. It also has an all-new map where you can combat in different breathtaking environments. Fluid character movements and realistic graphics make this game a highly enjoyable one, especially if you are a fan of battling games. PUBG （绝地求生）starts with 99 players being dropped off on an island with only a backpack. Once landed safely on the ground, one has to collect as many arms & ammunition, health packs, clothes which are strewn around the whole island. Once sufficient items are obtained, the player has to eliminate all the others and survive. 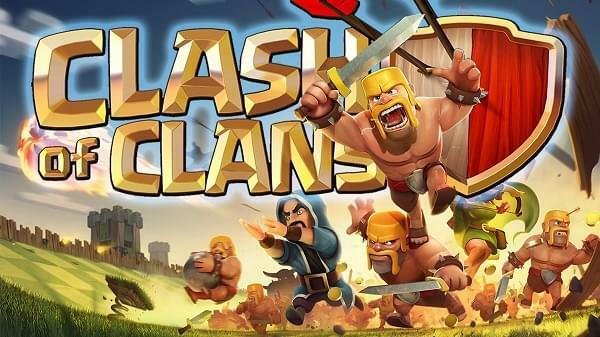 One of the most popular strategy based game of this year, Clash of Clans （部落冲突）has won the hearts of many gamers. It consists of mustachioed barbarians, fire-wielding wizards, and many other fantasy characters. Players have to start their clans and collect resources to forge an army to fend off raids by goblins. Furthermore, you can join forces with other clans and take on the global leader-board and carve your name on the PVP. So, if you love strategy games, then download Clash of Clans and join in with millions of players across the world as you build your village, raise a clan, and compete in epic Clan Wars! CrossFire （穿越火线）is a game that is heavily inspired by the popular shooting game named Counter-Strike. This one is also a knock-off shooter game with various modes such as free for all, search and destroy and death-match. There are more than 120 champions, dozens of items with various effects and an endless possibility of in-game strategies. Another plus point about this game is that players with sub-par internet connections won’t have any issues accessing every level from game-play to stability. Chinese games are created with a lot of passion. The unique graphics and impeccable flow of the game will have you addicted to them in no time. Now that we have given you a list of some of the most popular Chinese games in the year 2018, which one are you going to download first?